Good skin is both nature and nurture. Your genes may bless you with smooth skin but if you abuse it through bad diet, being a couch potato, smoking, alcohol and other environmental factors, you're sure to have breakouts and other skin problems. Each skin type has its own challenges so a personalized approach is best to get the best results. If you have black skin, the most common skin problems are sensitivity to various products and pigmentation. But just like any other skin type, the remedy is not complicated. 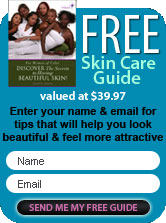 A diligent skin care regimen is all you need to keep it supple, smooth and looking its best. It is important to know what your skin care product contains. So the first question should be what ingredients are good for African American skin? Natural is best if you can find the right formulation. There are many products available today that claim to be natural but then include harsh ingredients such as petroleum, salicylic acid or benzoyl peroxide. There are many more chemicals that can make your skin break out so stay as natural as possible. Go for ingredients such as aloe vera, jojoba, rosemary, sage, citrus fruits, shea butter, olive oil, coco butter and other natural essential oil. Some are only available in extracts formulation but make sure that you get it from reputable brands. Ask for samples. Try it on a small portion of your neck. If there were no adverse reaction after 24 hours, the product is ok to use. Green tea and grape seed extracts are great for calming your skin and healing its cells. You may try it for a few days and see how your skin reacts. African American skin is prone to acne and discoloration so if you can refrain from using too many skin products at one time, it's better. What you need are just the essentials-gentle cleanser, a toner, moisturizer and sunblock. Yes, even dark skin needs protection from the harmful UV rays. If you're taking medications, your skin may become even more sensitive. If you're using antibiotics, pills and even multivitamins, you may have to change the current products that you�re using. Acne may be a sign that your skin is reacting unfavorably to a recent product that you might have used, or possibly foods that you may have eaten, so consult your dermatologist or esthetician to find out what ingredients are good for your skin. Keeping your skin care regimen simple is the way to go in caring for black skin. When you're not sure what type of skin you have, always go for products formulated for sensitive skin.